maskFastaFromBed -in hg18.fa -bed probes.500bp.complement.bed -fo hg18.probecomplement. you can first use intersectBed with the “-f 1.0” option. 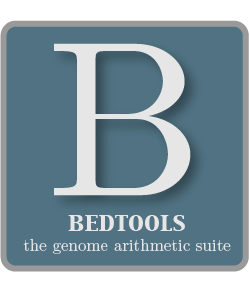 # One can combine SAMtools with BEDtools to compute coverage directly from the BAM data by using bamToBed. # Take it a step further and require that coverage be from properly-paired reads. # Use grep to only look at forward strand features (i.e. those that end in “+”). # Use grep to only look at reverse strand features (i.e. those that end in “-”). # We’ll require that 90% of the inner span of the deletion be overlapped by a recent ALU. 7.1 Mask all regions in a genome except for targeted capture regions. 7.2 Screening for novel SNPs. 7.4 Computing the coverage of BAM alignments on exons. 7.5 Computing coverage separately for each strand. 7.6 Find structural variant calls that are private to one sample. 7.7 Exclude SV deletions that appear to be ALU insertions in the reference genome.